Once Monaco came under the protection of Genoa it steadily grew. The fortifications were strengthened, there was a permanent garrison that was heavily armed and documents from 1252 even mention an “old castle” and a “new castle” which would seem to imply there were two. So it was no small task when the Grimaldi clan took it upon themselves to rest Monaco from Genoese control. As we have discussed before the conflict came about as a result of the struggle in Genoa between the Guelph and Ghibelline factions. The Guelphs were driven out of Genoa and into the protecting arms of Charles d’Anjou, comte de Provence. However, despite the Ghibellines taking over Genoa and being in a seemingly strong position they had not counted on the tenacity and aggressiveness of the House of Grimaldi. They planned a surprise attack on the main fortress on The Rock at Monaco. This operation was taken in hand, famously, by Francesco Grimaldi, also known as Francesco (or Francois) the Cunning. Others called him Francesco Malizia or “Francis the Malicious”. It was the night of January 8, 1297 -picture it. A clear, cold night on The Rock, jutting out into the sea with the roar of waves crashing at the base. Atop the rock stands an imposing castle. There is a knock at the door. 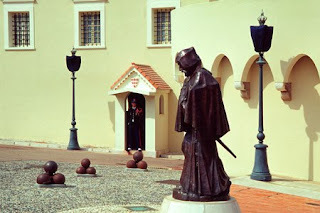 A sleepy guard finally responds, looking out to see a rugged, bearded man in the hooded brown robe of a Franciscan monk. The guard asks what the man wants. He replies that he is a poor monk, simply seeking shelter for the night. The tired guard opens the door, after all, Guelph or Ghibelline, they are all Christians. If the guard had been paying closer attention he might have noticed that the monk was not barefoot or heard a slight clinking noise of metal on metal as the man came through the door. But, it was too late -Francesco Grimaldi pulled his sword from under his robe and dropped the guard with a single blow. He pulled back his hood and waved his companions in from the door. From around the walls Guelph soldiers dashed into the fortress, including Francesco’s stepson Rainier Grimaldi, future first Seigneur de Monaco. The first Ghibelline soldiers were wiped out in minutes and through the night the Guelph soldiers fought their way through the castle. Imagine the cold dark night, the castle perched high on The Rock, the screams from within drowned out by the crashing waves. Did any soldiers fall from the battlements onto the jagged cliffs or pounding surf below? Perhaps so, perhaps not, none of the details are known to history, just the basic fact that the attack happened. By the time dawn broke The Rock, and with it all of Monaco, was in the hands of the House of Grimaldi. 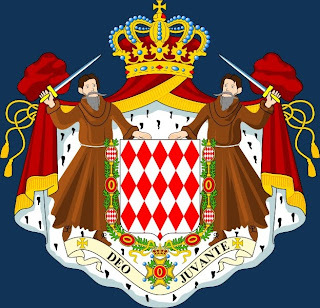 That night in 1297 was the start of the modern history of Monaco as we know it and the start of Grimaldi rule which has continued, with occasional interruption, to this day. The event is commemorated throughout Monaco. A number of stamps have featured the nighttime attack or Francesco Grimaldi. A statue of the intrepid Guelph stands in front of the Princely Palace and the event is symbolically represented on the Grimaldi coat-of-arms which feature two men dressed as monks brandishing swords.